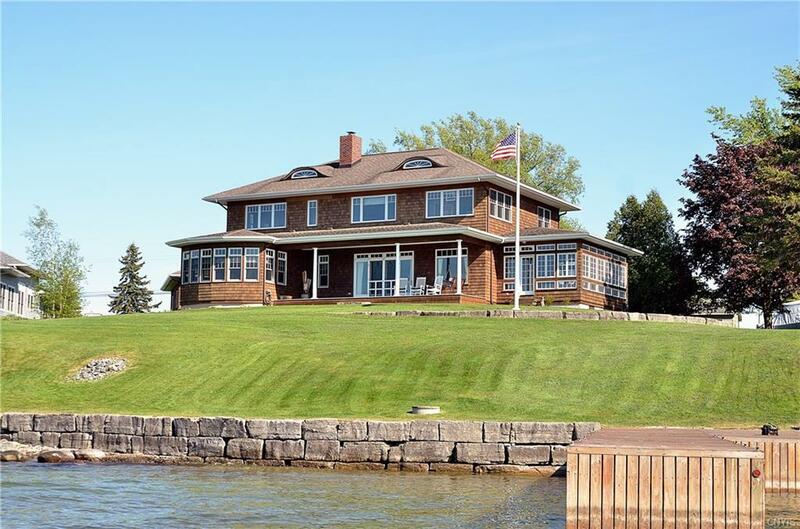 RIVERFRONT CUSTOM Colonial residence situated directly on the St. Lawrence River offering panoramic views of the islands, freighters, beautiful sunsets & TI Bridge. This traditional style home offers many quality amenities such as maple floors and staircase, Wood Mode cabinets w/granite counter tops, many architectural salvage features, master suite w/sitting room, walk-in closet & master bath, brick fireplace and mantel, 11 zone furnace w/central air, full bone dry basement w/9'ceilings, secret garden, over sized 3-stall garage, U shaped dock, public water & sewer, & much more! This estate-like property is just like new! Also an ideal location between Clayton & Alex Bay close to local river events and a wide variety fine dining among the 1000 Islands. GREAT PRICE & LOCATION! !